Status: offline 47 year old male complains of shoulder pain with abduction past 90 degrees. He states that he had an old rugby injury several years ago but was never seen for it. Status: offline There is a fair amount of spurring at the A-C joint probably from a previous seperation. Status: offline Calcification of superior portion of AC ligament? Ill bet this makes some nice noise during ABD. Status: offline The AC joint looks odd to me. With what the previous two posts stated, those could hamper movement once past 90 degrees. 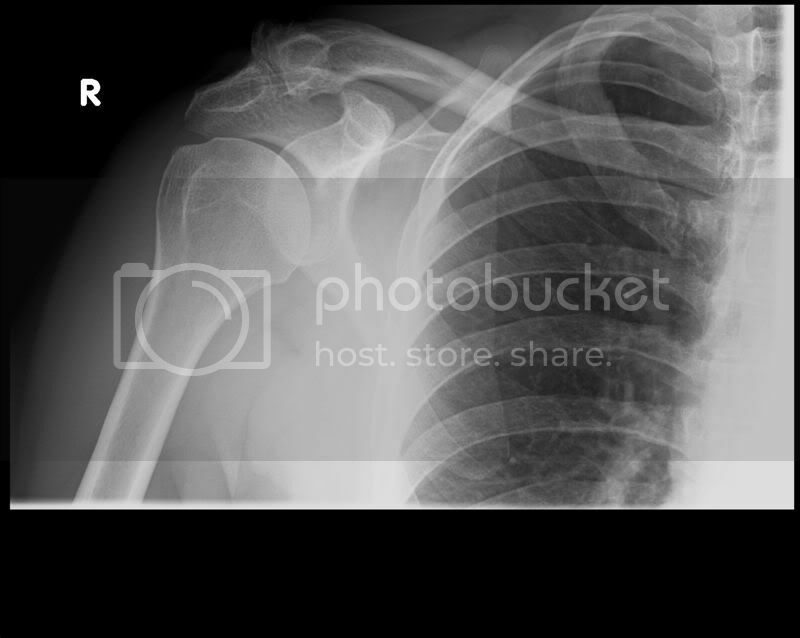 Status: offline Could be calcification of the superior A-C ligament, also of the coracohumeral lig. What really sticks out to me is the lack of joint space of the glenohumeral joint. Status: offline AC arthrosis, likely an old separation. 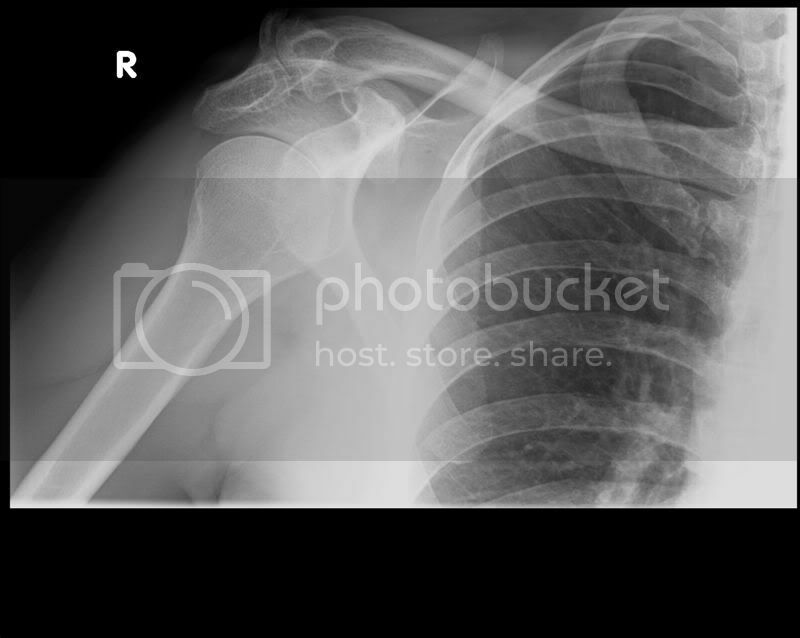 I don't see any osteolysis of the distal clavicle, which can commonly happen after an old AC injury or arthrosis. I don't see any glenohumeral arthritis. Status: offline Agree with the above - and think it may be possible that in the physical exam, GH capsular restrictions would be found - usually consistent with this type of head/glenoid relationship ("tight" is the best way to describe that) on x-ray. Status: offline Yeah, the ACJ space is almost gone and the suprahumeral space is a bit decreased. That combination would cause subacromial impingement and/or pain on abduction beyond 90 degrees. Incidentally it looks like there's a little smooth traction spur on the underside of the acromion that suggests an old coracoclavicular ligament injury. That's rugby for you. By the way, if you look at the very bottom of the second image, in the lung field you'll see a very small round opacity. Some folks might think 'oh no he has a spot on his lung' but it's an example of looking at a vessel on end, kind of like if you took a hose, layed it on a table and xrayed it, then turned the hose so that the opening was facing you and xrayed it again. The horizontally oriented hose would be more radiolucent, but when it was facing you it would look whiter because you're looking at the whole length of the hose. On a lung xray, the second example where it looks whiter (like a 'spot') would simply be described as normal summation of vascular structures. Status: offline Is there something going on in the SC joint. Looks odd to me. Could you be looking at the first sternocostal articulation? Status: offline Yes. Can't recall ever seeing something that edged before. Status: offline yeah jma, i was wondering the same thing. it looks quite jagged. Large degenerative osteophytes are present at the AC joint with moderate thickening of the distal clavicle suggesting an old healed fracture in secondary post traumatic changes. There appears to be moderate thickening at the distal end of the coracoclavicular ligament attachment suggesting also a prior AC separation that has healed. No definite acute fracture noted. Status: offline Thanks for the update. Keep them coming in! Status: offline Are PT's qualified to read X-rays? Please a look at the description of the purpose of this section of this forum. You will see that we are here for learning only. No patients are harmed during the viewing and hypothesized interpretations of these films by PTs. Status: offline LOL Shill...well said and to the point. Status: offline Will somebody take out the trash, already? Status: offline PTs have been reading XRays since time immemorial. The greatest value is educating patients who have been scared stiff by a doctor saying "your spine is riddled with arthritis; it will only get worse" or words to that effect. Understanding what XRs show is useful. It separates the nonthinking technicians from the professionals. I support Jason's last post.